If you're already feeling regret over some of your life choices this might be a tough read. 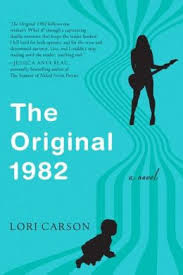 In The Original 1982, Lori Carson's Lisa Nelson imagines what her life would have been like if she hadn't had an abortion. She imagines how she would have lived differently and who the child would have grown up to be. This might sound like some sort of anti-abortion book, but it's not, not really. Nor is it Pro-Choice. It's a book about a woman regretting a decision or at least wondering what could have been. I think, you know, this is something we all do, what about that path not traveled? And the circumstances surrounding her abortion kind of show just complicated these things can be. Perhaps this doesn't sound terribly revolutionary, but she since she writes from the perspectives of young artists, particularly musicians living in New York City, it has a unique and interesting setting. And I found this book oddly compelling and I totally cried at the end, TEARS. I think it hit a few soft/tender spots for me, though, anyway. I am getting older and I have my share of regrets and particular junctures that I think, "if only I'd chosen this path". Also, Lisa loves a man, the father her imagined child, who never loves her back properly. And it's a very obsessive love where she can't exactly make the best choices because she's ruled by this compulsion. And it's not...I don't know how to say this, it just is. And it's sad, you know, that for some people there is *that* person who rips you apart and consumes you for so long that you never really get over them. Sure you go on and love other people, but that relationship still informs so much of who you are. (this is always what I think of when I think of the "Guard your heart above all else for it is the wellspring of life" proverb, because it's so true! We give away our hearts, especially when we're young, so easily with no thought to just how much it might change us. I mean obviously loving courageously and not being afraid to love are good things, but some of us are more sensitive and require more care than others, okay?!?) Also, Lisa values kindness more than anything else, which, yes. Anyway, most of the book is about this imagined life with her daughter, but the end goes back to real time and what her actual life is..how she's living with regrets and what her reality is, etc. In some ways, I feel like this book is just a really beautiful, honest portrait of a single woman's inner life. You know, there's a lot of pressure to have life look one way (married with a baby, tbh, also nowadays have a successful career and do it all!). And some women choose something else and actively choose something else, but that doesn't mean that they don't have really complicated feelings about it. (I think mothers do, too! Don't we all!) So there's a melancholy, bittersweetness that's just inherent in the idea of this book. Oh also, I like the way she weaves elements of her actual life into her imagined life...like, she comes across open mic nights later in life and imagines that if she'd had her baby, she probably would have been participating in them. If this sounds like something you might enjoy, the publisher is offering two copies for giveaway for those of you in the United States. Just fill out the form below to express your interest.